Concentrates on one stressed part of the body. A 60 minute massage designed as a gentle introduction to the benefits of massage therapy. Our signature body massage developed to promote greater heights of wellness through deep massage techniques adapted to your needs. Share the experience of relaxation with a side-by-side massage in our tranquil couple's suite. 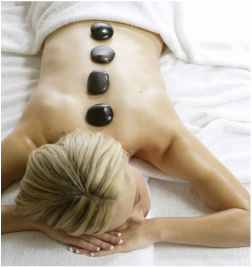 In this 90 minute massage, the use of warm, smooth river stones creates a flowing massage designed to loosen tight muscles, relieve stress and ease tension. A nurturing massage for the mother-to-be with relaxing balm. A combination of several Yoga and Acupressure massage techniques are demonstrated in this 90 minute massage. During the massage, the client remains fully clothed and no oils are applied.